Bonehead question here, but I don't grasp the difference between a System Backup and a Disc Backup. I'll be using a USB-connected hard drive and simply want to be able to boot and run; that is, OS, all files, everything as if the backup disc is my computer's hard drive. So which of these options gives a true 'image' of my hard drive that I can boot from and run? Also, can this backup be used to clone another hard drive in case mine fails, or do I need to do a Disc Clone or get the upgrade and do a System Clone... same question, what's the difference? Thanks! I don't think you understand what a backup really is. It's only an image (file) of your drive that you use to "restore" your drive to a new drive in case of a drive failure or to the same drive if it's only a problem with corruption, missing files, virus, etc. where you can't boot the drive. You can use your USB connected drive as a storage location for that image (file) but you can't boot from it. A System Backup only images your OS partition and any other partitions necessary to boot up. If your OS partition (usually your C drive) contains your OS, your programs and data, they are all included. A Disk Backup images ALL partitions on the drive. Some people have their drive partitioned to include a D partition which would be included in a disk backup but not in a system backup. A disk Clone is used when your drive is operable and you just want to transfer it to another drive. You usually want to clone an entire drive although you could just clone one or more partitions. Okay, Flyer, thanks for that; it does make things clearer. When I go into File Explorer in this Win10 machine and find "This PC", there is a list of folders under that, which include 'Documents,' 'Desktop,' 'Downloads,' 'Videos' and all manner of user files and folders that you'd expect the system to include. Down at the bottom of the list is a folder marked 'OS (C:)'. If I open that folder, drill down to 'Users' and open the folder there with my name on it, I see pretty much the same thing I saw up above, with Documents, Videos, Desktop, etc. Now I doubt that all those folders are actually 'magnetic' duplicates of what I saw up above, figuring that instead they are the exact same ones, simply shown in a redefined manner. And, in fact, I can add a 'New Folder' to the 'User/Name/Documents' folder and see it pop up under 'Documents' directly under 'This PC.' This would make me think that a System Backup and a Disc Backup would be pretty much the same thing; that is, a System Backup of the 'OS (C:)' folder would indeed include everything. I can open the Disc Management utility and see that there are partitions, but they appear to be empty. I've attached a snapshot and would appreciate your taking a look and confirm my findings, or steer me in a proper direction of thinking. You're on the right track, but there is a small glitch in Backupper that they say is not a real glitch but is there so you can expand your C drive to fill a new drive if restored to a larger disk. You can only expand a drive if there's free space to the right of its partition. A SYSTEM backup will copy the 499MB EFI partition, the OS partition but not the recovery partitions. 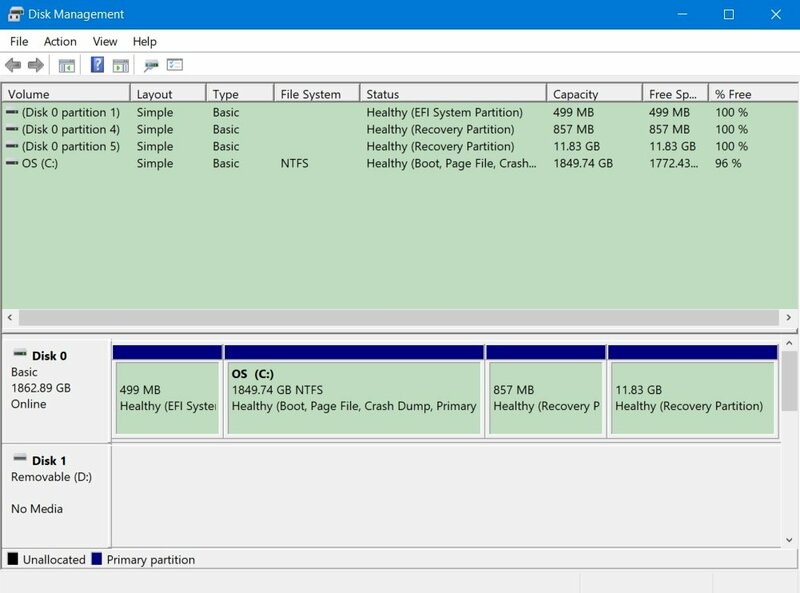 The 11.83GB partition appears to be the manufacturer's recovery partition used to restore your system to it's FACTORY delivered state (which you won't need if you're restoring to a new PC or really any time after you've updated Windows. Why would you want to reinstall all the manufacturer's crapware anyway?) and the 857 MB Recovery Partition, which windows put there but again is not necessary if you have a Windows Recovery USB or Disk created. It's just a way to use Microsoft's startup utilities. And if your drive is damaged, you may not be able to get there anyway, hence the reason for the recovery CD/DVD. I used an Aomei back up image to restore my C drive to a new SSD and got those results. I expanded my C drive to "almost" fill the whole disk but left a little space. When I upgraded to 1803 in May, that process put that Recovery Partition back. But again, it's not needed. A DISK backup will copy all 4 partitions but again there is still a small glitch using this product. Aomei is aware of this but hasn't fixed it yet. After your Disk restore, it seems Aomei may assign a drive letter to the partitions that don't have any letter associated with them now. They can be removed in Disk management. But if the EFI partition is given a letter, your PC won't boot and you will have to remove it's letter using Diskpart in a Pre-Windows environment. This is really not hard to do but just things you should be aware of. For that reason, I use the System option for my backups. This is a lot to throw at you but explains what I've run across using Aomei. Just so you know, you cannot use your Disk 0 (as you show it) to store your backup image. It can be a network share, a removable disk or another installed HD. A removable disk will preclude using a schedule unless it's connected when the schedule is supposed to run. Flyer, you're a wealth of information, and... you make it understandable. If you will, and can make it simple, would you explain the advantage of using the AOMEI software for making a System or Disk Backup (onto an external HD in my case), over simply using the utility that comes with Windows, along with Windows' own Startup Disc routine? The ultimate goal, of course, is to guard against the computer's HD crashing, or getting stolen or whatever. I'd be willing to perform this exercise every couple of months; I already use an incremental files/folders backup utility from another vendor for more frequent data-only backup. That is a great question and the answer is not a straight forward one. It's very subjective and open to many opinions. First and this is not my view, but only what I've read on some blogs.... Windows backup has been found to not be reliable. I cannot verify this. Now back to real answers. Windows backup can only be run manually. Aomei can run on a schedule with options to delete older backup sets automatically (Pro Version). This may not be important to you if you're using a detachable external HD. Obviously you would run Aomei manually also. And that is a great backup plan.... backup to an external HD that can be stored away from your PC. This would protect you from theft (of your PC), fire or a virus that spreads through your system. I do this for both my PC's about once a month and delete the older backup set manually afterwards. I also have a weekly Full System backup run for each with daily incrementals (keeping only the last 7 sets... a Pro version option) to another internal drive. Aomei is also more versatile. With Windows, you can only restore a full backup. With Aomei you can go into your backup and restore just a file if you want. If you look through Aomei's help files you'll see many more things you can do with the program. Even with the free version. I'm not here to sell Aomei or convince you to use it. Only giving my opinion. I was a Norton Ghost 15 user and still think even though it's not been supported since Win7, it was a much better program than Aomei is now. I've used Aomei's restore function (instead of cloning) on my own PC (testing and actual) and several times for friends when they were going from a HDD to SSD without any problem (except for one self induced one when I used an MBR formatted SSD to use as the target for a friend's GPT system). Ultimately, the best thing I can recommend is to make a backup image with both Windows and Aomei and try to restore to a spare drive and then booting from it. This really should be done by anyone using a backup program. Seeing if you can boot from their recovery disk and doing a restore. If you don't do this, you'll really never know if what you're doing will work. And to be honest, I still read the Norton Forum boards for Ghost and the general opinion there is most use Macrium Reflect free version for their backups. I've only read through their on line manuals and I think Aomei would be easier to use and understand for most people. Perfect! You have been a big help. One last question, if I might. The USB external hard drive I'll be using for image backup is 250GB. My computer hard drive indicates that 91GB is currently used. Even though it's tight, can I partition that external drive into two, 125GB sections and use those back-and-forth for my image backups every other month? Maybe assign the partitions as A and B or Even and Odd to keep them straight? I don't anticipate expanding this system much, but don't want to paint myself into a corner. Again, many thanks for sharing your wisdom. Yes you can partition ... May be smarter to use X and Y so not to interfere with any other disk. Your Aomei image would be about 85-88GB so you could keep 2 before manually erasing one. However it may be best not to partition. Then you could create ONE backup definition with the removable drive as the destination (vs needing 2 sets if you use 2 partitions). That way when you plug in the drive and open Aomei you would be ready to go. You could then keep 2 backup images and before running the next, manually delete the older one to make room. Make a folder on the removable drive called Aomei Backup and use that for file location when you set up the backup to keep things organized. Good luck with this.